This is a 1.9-billion-year-old stromatolite — or mound made by microbes that lived in shallow water — called the Gunflint Formation in northern Minnesota. The environment of the oxygen “overshoot” described in research by Michael Kipp, Eva Stüeken and Roger Buick may have included this sort of oxygen-rich setting that is suitable for complex life.Eva Stüeken. The research was funded by grants from the National Science Foundation, NASA and the NASA Astrobiology Institute and Canada’s Natural Sciences and Engineering Research Council. Scientists have found what they think is the oldest fossil on Earth, a remnant of life from 3.7 billion years ago when Earth’s skies were orange and its oceans green. 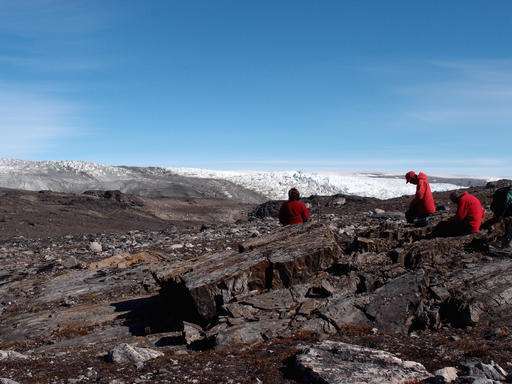 In a newly melted part of Greenland, Australian scientists found the leftover structure from a community of microbes that lived on an ancient seafloor, according to a study in Wednesday’s journal Nature . The discovery shows life may have formed quicker and easier than once thought, about half a billion years after Earth formed . And that may also give hope for life forming elsewhere, such as Mars, said study co-author Martin VanKranendonk of the University of New South Wales and director of the Australian Center for Astrobiology. “It gives us an idea how our planet evolved and how life gained a foothold,” VanKranendonk said. Scientists had thought it would take at least half a billion years for life to form after the molten Earth started to cool a bit, but this shows it could have happened quicker, he said. That’s because the newly found fossil is far too complex to have developed soon after the planet’s first life forms, he said. 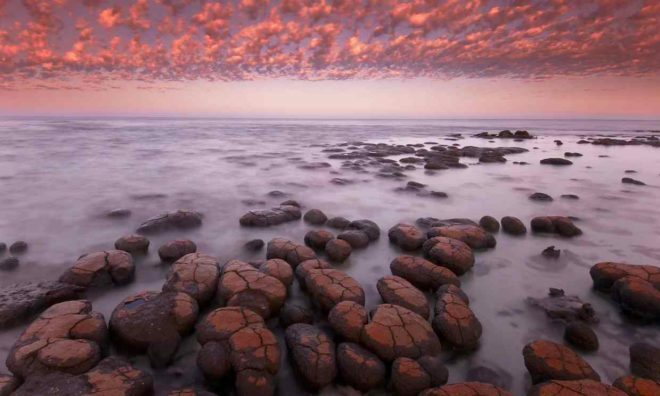 In an outcrop of rocks that used to be covered with ice and snow which melted after an exceptionally warm spring, the Australian team found stromatolites, which are intricately layered microscopic layered structures that are often produced by a community of microbes. 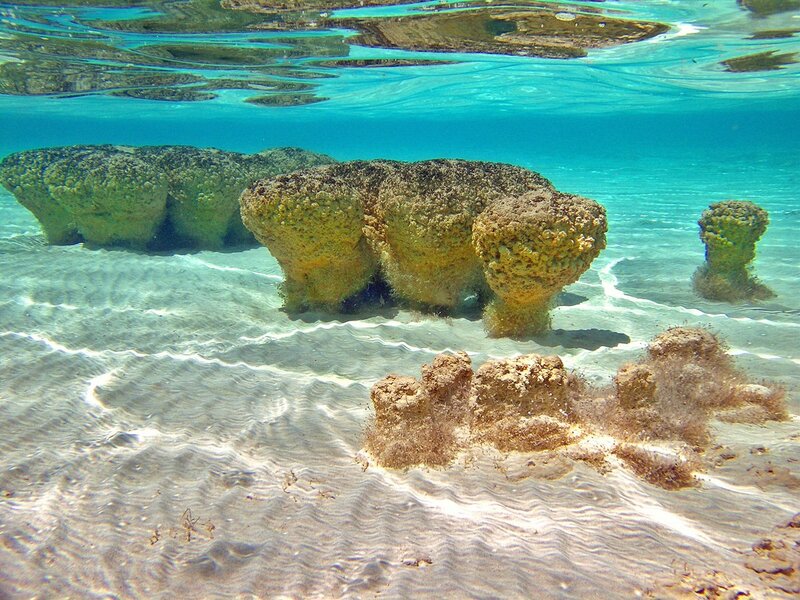 The stromatolites were about .4 to 1.6 inches high (1 to 4 centimeters). It “is like the house left behind made by the microbes,” VanKranendonk said. Scientists used the layers of ash from volcanoes and tiny zircon with uranium and lead to date this back 3.7 billion years ago, using a standard dating method, VanKranendonk said. “It would have been a very different world. It would have had black continents, a green ocean with orange skies,” he said. The land was likely black because the cooling lava had no plants, while large amounts of iron made the oceans green. Because the atmosphere had very little oxygen and oxygen is what makes the sky blue, its predominant color would have been orange, he said. The dating seems about right, said Abigail Allwood , a NASA astrobiologist who found the previous oldest fossil, from 3.48 billion years ago, in Australia. But Allwood said she is not completely convinced that what VanKranendonk’s team found once was alive. She said the evidence wasn’t conclusive enough that it was life and not a geologic quirk. “It would be nice to have more evidence, but in these rocks that’s a lot to ask,” Allwood said in an email.